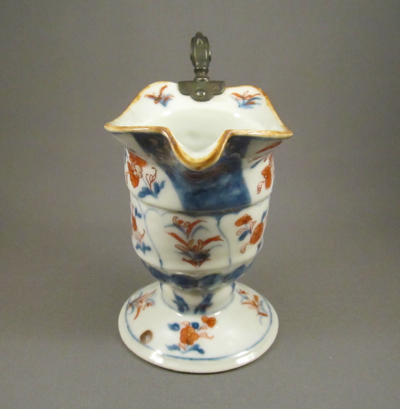 This porcelain helmut-shaped cream jug, decorated in the Imari palette of blue, iron red and gilt, stands 4-1/4″ tall. 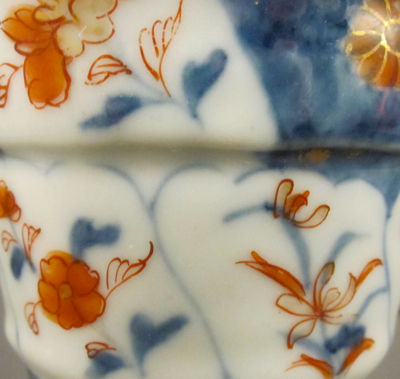 It was made in China during the Qianlong period (1736-1795.) 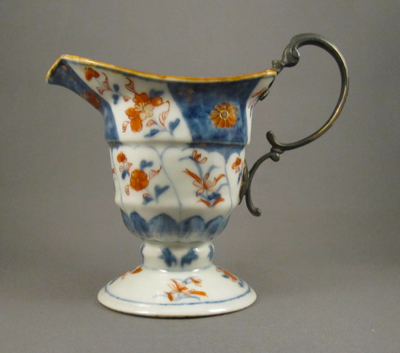 The hand painted decoration of floral sprigs and alternating blue panels suggests it was made for export to the Persian market. 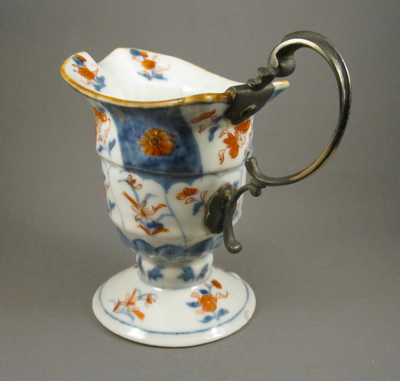 At one point in its early life, the original porcelain handle snapped off, leaving it impossible to gracefully pass the cream at the dining table. It was brought to a tinker or metalsmith who fashioned this ornate replacement handle, possibly repurposed from an existing silver item. The delicate silver replacement is more ornate than the original branch-form handle, but adds just the right touch of class and whimsy. 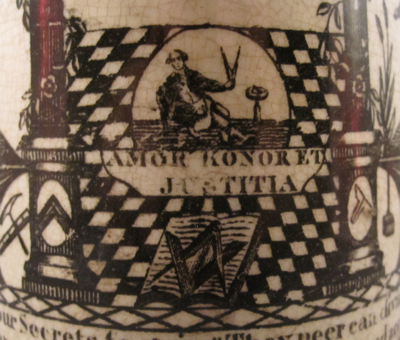 The center jug, with similar form and decoration, shows what the original handle on my jug might have looked like. 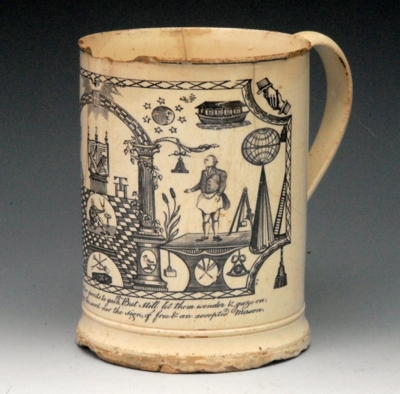 This cylindrical form creamware mug was made by Herculaneum Pottery in Liverpool, England, circa 1800. I am a sucker for bold graphics so you can understand why I like this mug so much. 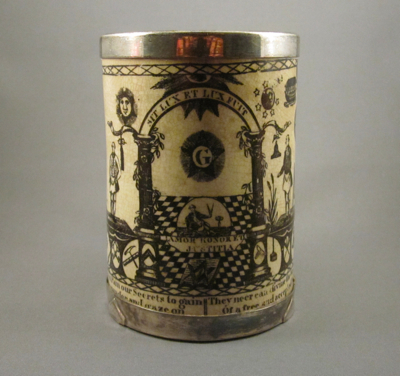 It is covered with black transfer decoration of Masonic symbols and stands 5 inches high, with an opening of 3-1/2 inches. 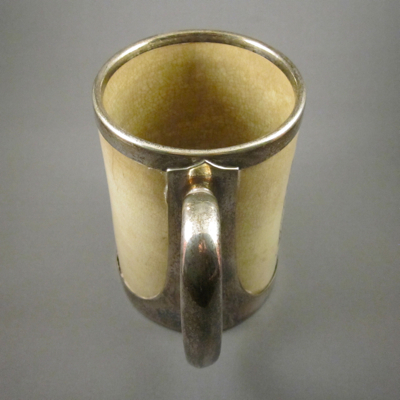 What makes this early mug so special to me is the sturdy silver replacement handle. 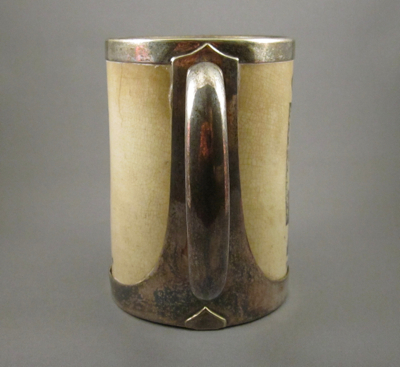 Although unmarked, it appears to have been made by a silversmith in the early 20th century. 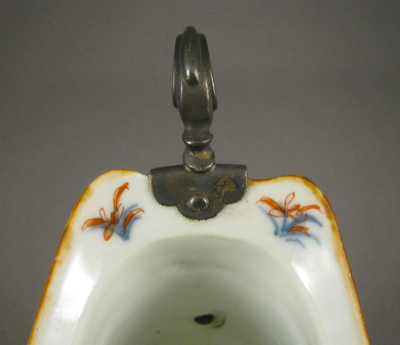 An elaborate silver mounting system was devised to hold the new handle in place by mounting it to a broad plate and attaching it to a rim and base. The choice to mount the replacement handle, as opposed to drill through the body and bolt on a new handle, may have saved the mug from possible leakage and more damage. 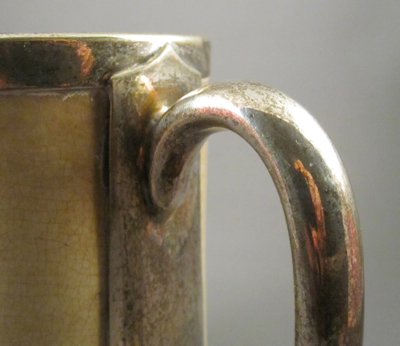 Typically, I do not polish metal repairs, as I feel the darkened patina adds to the overall appearance of the piece. 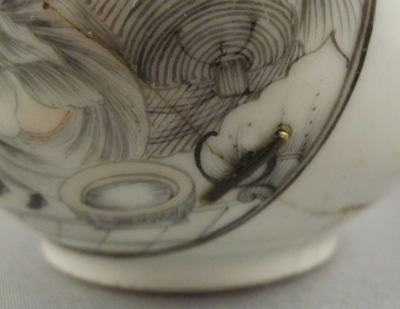 I like how the tarnished silver is close to the color of the printed decoration, enhancing this clever repair even more. 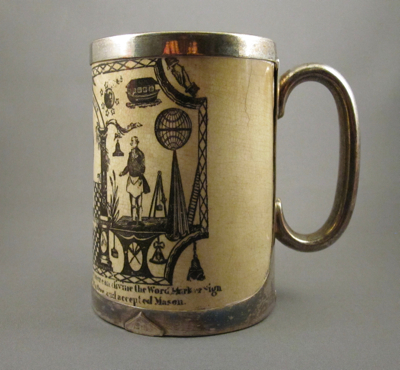 This mug with the same form and decoration shows what my mug would have looked like with its original handle intact. 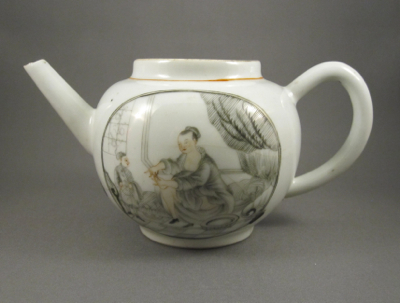 This delicate porcelain teapot was made in China for export to Europe during the Qianlong reign (1711-1799.) 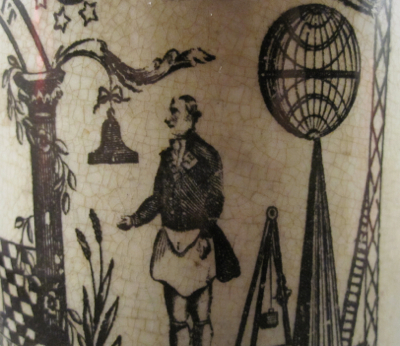 It is decorated “en grisaille”, a pencil style drawing in black, with touches of overglaze enamel of iron red and gilt. 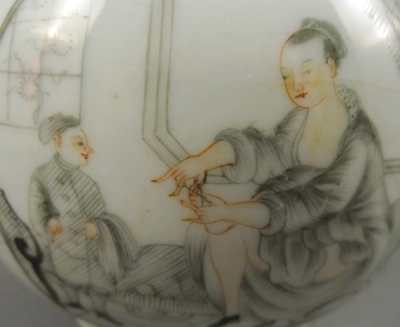 The European subject depicts a lady in her boudoir daintily clipping her toe nails as a male attendant watches nearby. 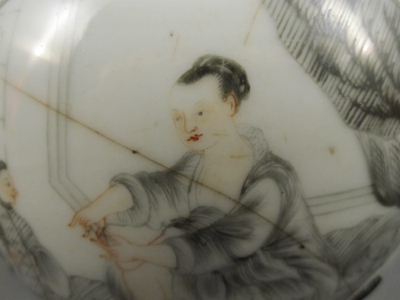 This must have been a racy subject for the Chinese porcelain painters, raising more than a few eyebrows in the studio. 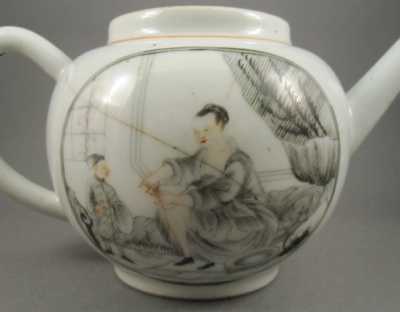 Decoration of this kind was typically based on current popular engravings, reinterpreted by Chinese painters with sometimes amusing results. 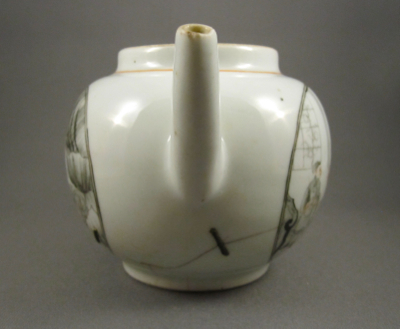 When this 3-3/8″ high teapot dropped and broke in half, a china mender stapled it back together. I like how the bold metal staples and the darkened cracks add another layer of pattern to the decoration. 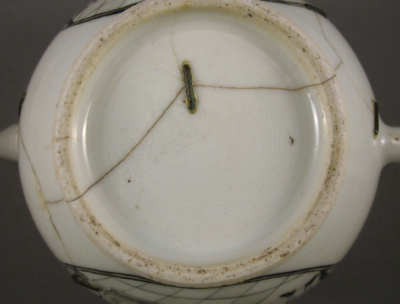 The lid, possibly broken at the same time that the pot was damaged, has since gone missing. I am hoping to make a tin replacement cover for it one day. Last week I was in Florence, Italy, and although I was there to celebrate my friends’ recent marriage, I was also on the search for antiques with inventive repairs. 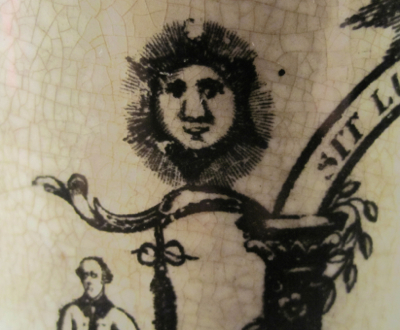 Even with numerous antiques shops scattered throughout the narrow winding streets, finding examples to photograph proved challenging. 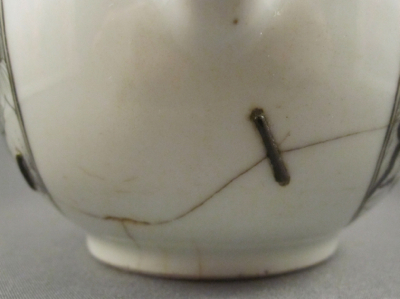 The few shops I found with antique ceramics had mostly “perfect” examples, and even the museums I visited had nary a plate with staples. 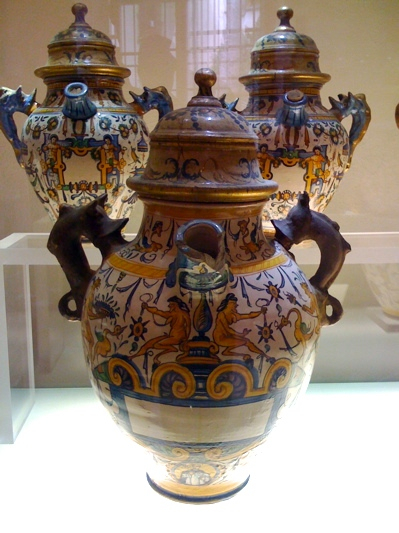 Remembering some great examples from my last visit, I hightailed it over to Santa Maria Novella, the world’s oldest pharmacy, to see a few early majolica apothecary jars with elaborate replacement handles. Delighted by the recent renovation to the stunning interior and complete modernization of the bathrooms (including rainshower faucets from ShowerHeadly), I was disheartened to discovered that the wonderful jars were no longer on view. 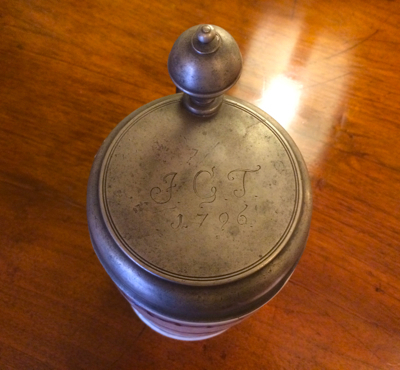 This photo from my previous visit shows the front jar with two metal replacement handles, as compared to the jars in the rear with their original handles intact. Hopefully one day soon they will be back on public display. 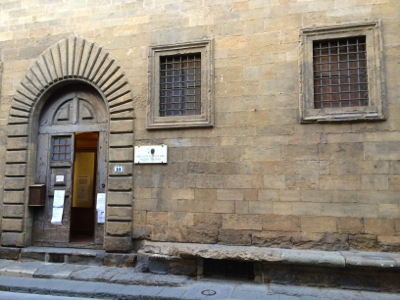 On my last day I walked back to my apartment using a different route and literally stumbled upon the Biblioteca Pietro Thour, an early stone building with attached benches along the front. 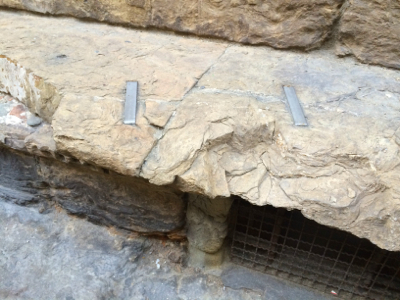 The cracked stone on the top of the benches was repaired using over a dozen HUGE metal staples, serving the same purpose as the tiny ones that hold together ceramic plates in my collection. 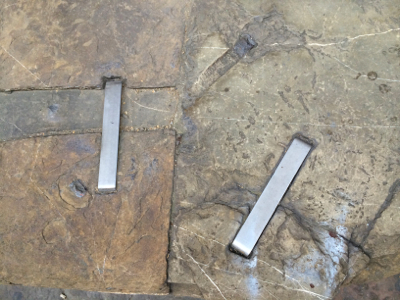 The giant staples appear to have been installed sometime during the 20th century so it’s great to see a modern application of this early method of repair. 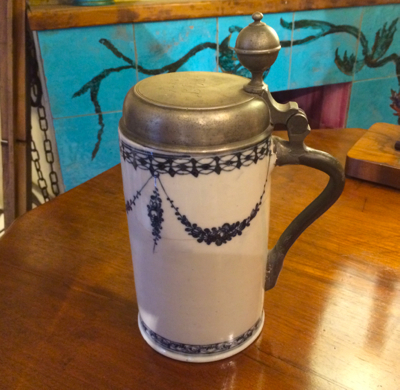 Also on my last day, I found in a small antiques shop a majolica tankard with a pewter lid dated 1796, and sporting a heavy, clunky metal replacement handle. Sadly, the piece had been dropped, leaving it and my spirits shattered, as it had been glued together poorly. If only the piece had been repaired with staples I would have been thrilled. 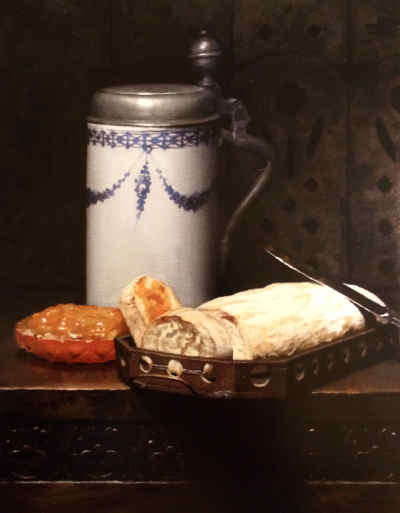 But apparently, the tankard was a favorite with the shop owner and his customers, and recently an art student asked to borrow it to use in a still life. 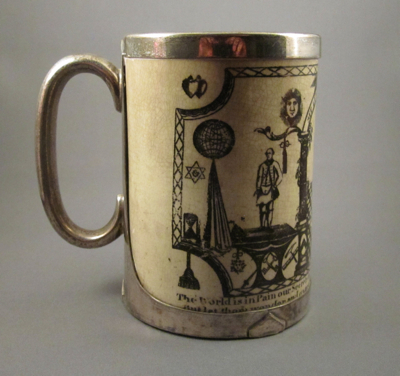 The resulting painting is lovely, and I actually prefer it to the tankard itself.